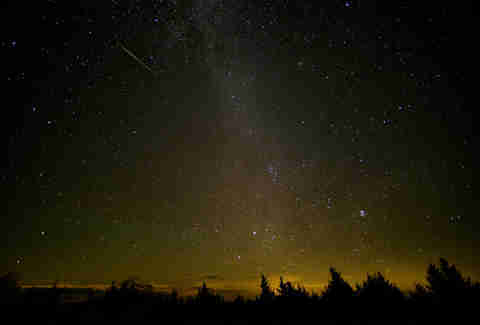 Meteor Shower ‘Outburst’ Will Have 4x the Meteors as Usual Tonight. Here's How to See It. Hot on the heels of the best meteor shower of 2017, the Ursid Meteor Shower peaks the night of December 21 into the morning of December 22. "We call the Ursids the cursed Ursids because they occur so close to Christmas and no one wants to observe them," laughs Bill Cooke, who leads NASA’s Meteoroid Environment Office. The Ursids pale in comparison to the year's big ones, like the Geminid and the Perseids. "This year we're expecting an Ursid outburst. Normally, the Ursids have a rate of around 10 per hour," Cooke says. "But this year, the Ursids may jump up to 40 or 50 per hour. We expect on December 22 to encounter a stream of material ejected from [Comet 8P/Tuttle] over a thousand years ago." At a rate of 10 per hour, the Ursids aren't usually anything to write home about, but an outburst will make it worth viewing if you can brave the dropping temperatures across the US. The Ursids have a sharp peak. That means you want to catch the show on time. "It doesn't last very long," Cooke says. "If you're not out on the night of the peak, you're going to miss it. Outbursts generally last on the order of a few hours." The Ursids will be visible throughout the night, but Cooke says your best bet is just before dawn on the 22nd. Instead of staying up late, like you might with other showers that are best just a while after midnight local time, you might want to get up early. The Ursids will appear to emanate from the Little Dipper or Ursa Minor. However, you shouldn't stare at the constellation or radiant to catch them. You'll want to be looking a little away from the constellation since the meteors will be moving away from the radiant. 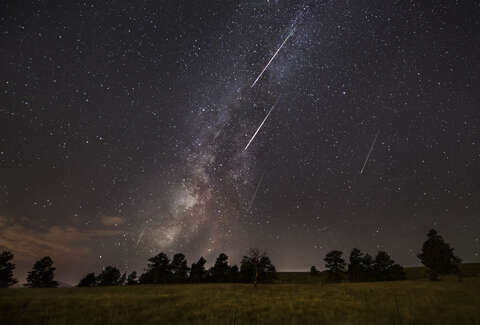 As always with a meteor shower, you want to get into an open field far from the lights of the city to ensure you see as many meteors as possible. (EarthSky has a nice tool for finding dark sky near you.) That's especially true with the Ursids. The shower isn't noted for having fireballs like the Geminids, so you'll need a dark sky to see them. It's best to arrive a little early and give your eyes 20 to 30 minutes to adjust to the darkness. Then, just look up. Don't use binoculars or a telescope, as those have the effect of narrowing your vision, which isn't helpful when watching meteors. Also, bring a thermos of coffee or hot chocolate. It's going to be cold for the brave souls who want to watch meteors in December.